Don't you just love packages? Even when it often means that a credit card bill is associated with it? I do! I do! For awhile now, I've been stopping myself from ordering online since it takes ages (2 to 3 weeks) for my purchases to arrive. I just got really tired and impatient in waiting. But the shopaholic in me can't stop!! The instigator? 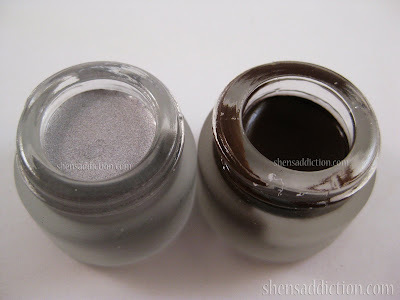 Nikki of Askmewhats' Eureka Moment: Coastalscents Gel Liners post (Hihihi!). I mean, how can my shopaholic heart, body and soul resist? Even if my credit card limit is nearing its end, I still clicked on that Pay Now button while praying I don't get into emergency situation because my CC won't be able to bail me out. Without much further ado, here they are!! I honestly feel I robbed Toma with all the Free stuff included here!! :) I mean, I get a FULL Size Eyeshadow, about 1/8 tsp of another eyeshadow then I still get a coupon for a free eyeshadow on my next order! Not to mention that it's FREE SHIPPING!! 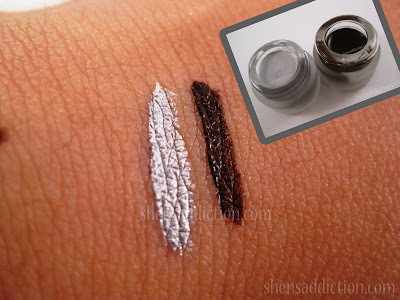 We all all know how pigmented mineral eyeshadows are. 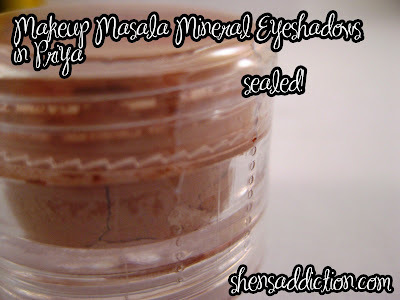 Makeup Masala Mineral doesn't disappoint us in that department. 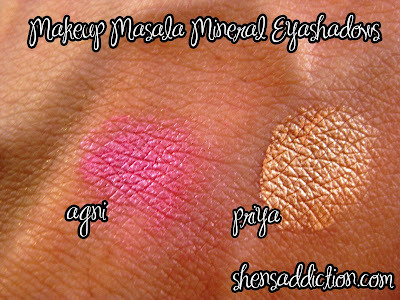 :) I love Priya because it goes with my skintone so well. 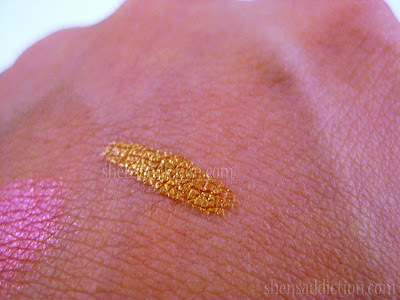 Agni is just a vibrant pink that I love.. for a Hello Kitty inspired look, perhaps? Did I just whet your appetite for the actual stuff I got? 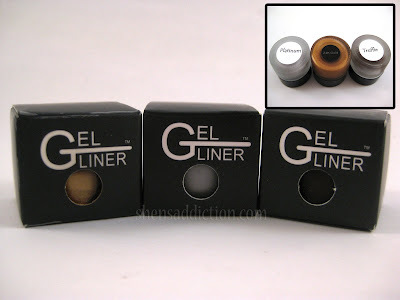 I don't think so since I must be the last person on earth who got this infamous gel liners. And true to its hype, it is pigmented. Greatly so but.... too creamy or mouss-y for me. I commuted with this babies so it was exposed to hot weather and when I got home, upon checking the contents, my 24K gel liner looked liquidy or runny in consistensy. I was scared that it will be the same when I applied it. I put it on the freezer to cool it first before swatching it. Thankfully, My Platinum and Truffle didn't look runny but was nevertheless to soft in consistency. This falls short a little to my expectation but compared to the others that I've tried, this gel liners are awesome (channeling Barney Stintson here from How I Met your Mother). Platinum: OMG> This liner get 5 stars from me! So rich in color, not sparkly shimmery splendid but a true platinum silver. I love it! Can't wait to use this in future looks. A Lady GaGa inspired look... Hmm... Maybe, maybe not. Let's see. 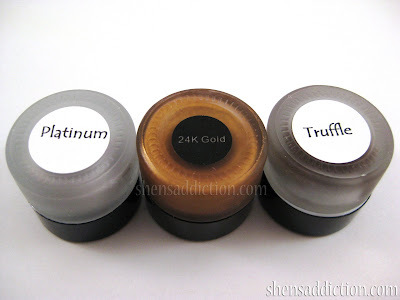 Truffle: Looks good enough to eat! Not likely! Hehehe! 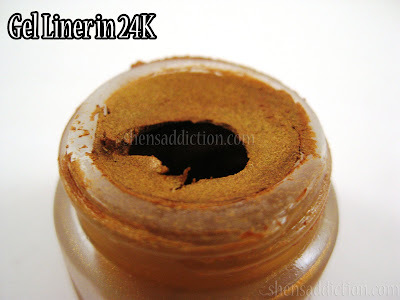 The brown color of this liner is just what I was looking for. Dark chocolate! Yum. Yes, I gotta remember that this is not exactly chocolate.. it's just the name. 4 out of 5 on the gel liner. Grab babies like this and more at Makeup Mix Shop. Phew!! Enough blagger from me. I still have so much to watermark for my future post and my Adobe Photoshop Trial Time is nearly up! I'm hoping to post gifts that I've received from blogger beauties on my next post. Wish me luck!